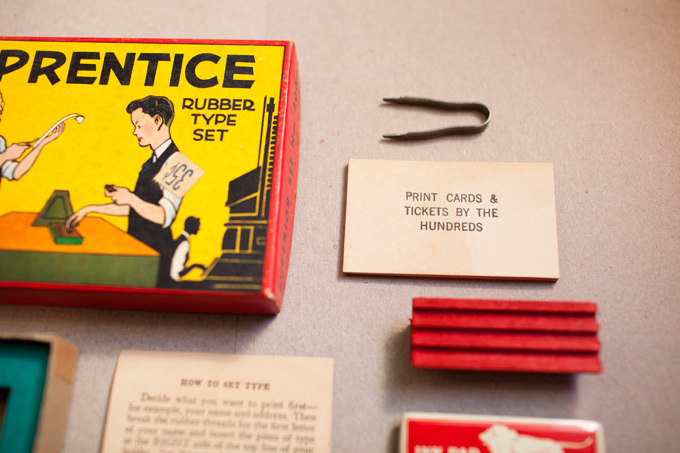 While in Michigan last month, Brad and I picked up this 'Prentice Rubber Type Set at an antique store. As you see, at one point it cost 35 cents - we paid more than that, but not a whole lot more! The antique stores in Michigan had totally different pricing than we're used to. Certain items (furniture, glassware, etc.) were priced quite high, but ephemera-type items (books, paper goods, and this beauty) were priced much lower than what you'd find in Seattle. (It was good news for us, of course!) I was so excited when we found this, and i'm thrilled to share it with you now! 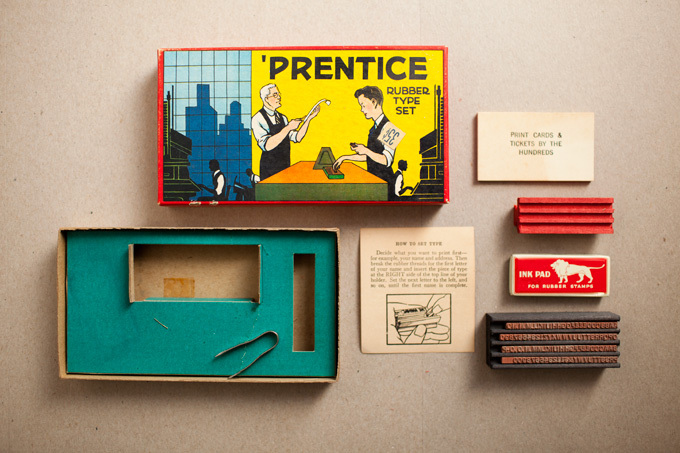 This boxed set is designed as a child's educational toy, teaching the principals of setting type by hand. (Early in the 1900's this would have been a valuable life skill!) The set includes a full rubber alphabet (with extras), a wooden piece (for setting the type within and using at the stamp handle), an ink pad (with a rad lion on it), a pair of tiny tweezers, a tiny pad of paper, and a sheet of instructions. It's in perfect shape - the type has never been used, so it's not inky and dirty like most of the sets I found online. And the box itself is really lovely - bright colors and a lovely illustration. It's got a place of honor on our studio shelves right now. This adorable toy is the "Superior Set No. 4000" made by the Superior Marking Equipment Co. (or SMECo.) in Chicago, Illinois. I haven't been able to find a ton of info about the set, but this site suggests it's from the 20's or 30's. Apparently SMECo. made toy printing presses as well, which I found slightly more info on. (You can check them out here and here.) My dad picked a similar toy press up at an antique store last year, and has been looking for the rest of the pieces ever since. I've yet to check if these pieces would work, but be assured - we'll try it! Decide what you want to print first- for example, your name and address. Then break the rubber threads from the first letter of your name and insert the piece of type at the RIGHT side of the top line of your holder. Set the next letter to the left and so on, until the first name is complete. Then put in a piece of blank rubber called a "spacer" to keep the words from running together. Continue on with your last name. When your line is set, look at it to make sure that each letter has the margin of blank rubber (called a shoulder) at the bottom. If it is at the top, you have set the letter upside down. To print, tap the set-up holder carefully on the ink pad several times, then press it firmly on the top sheet of a stack of paper or cards. Presto! You're a printer.